aloft: i.e., in the second-story acting space above the back of the main stage. Enter ROMEO and JULIET aloft. 5 Believe me, love, it was the nightingale. 8 Do lace the severing clouds in yonder east. 9. Night's candles: i.e., the stars. 10 Stands tiptoe on the misty mountain tops. 11 I must be gone and live, or stay and die. 13. some meteor that the sun exhal'd: Meteors were thought to be luminous vapors which the sun's heat drew from the earth. 15 And light thee on thy way to Mantua. 16 Therefore stay yet; thou need'st not to be gone. 18 I am content, so thou wilt have it so. 20. reflex of Cynthia's brow: i.e., moonlight. 21-22. beat / The vaulty heaven: echo in the arched heaven. 22 The vaulty heaven so high above our heads. 24 Come, death, and welcome! Juliet wills it so. 25 How is't, my soul? let's talk; it is not day. 26. hie hence: hasten away from here. 26 It is, it is: hie hence, be gone, away! 28. Straining: straining its voice with. sharps: high notes. 29. division: variations on a melody. 30. This: i.e., this lark that we hear singing now. 28 Straining harsh discords and unpleasing sharps. 30 This doth not so, for she divideth us. 33. arm from arm: out of each other's arms. affray: frighten. 34. hunt's-up: a song that announces the coming of dawn. 34 Hunting thee hence with hunt's-up to the day. 35 O, now be gone; more light and light it grows. 36 More light and light; more dark and dark our woes! 40 The day is broke; be wary, look about. 41 Then, window, let day in, and let life out. 42 Farewell, farewell! one kiss, and I'll descend. 43 Art thou gone so? love, lord, ay, husband, friend! 46. by this count: i.e., by my way of counting (in which every minute away from you counts as a day). much in years: very old. 47 Ere I again behold my Romeo! 50 That may convey my greetings, love, to thee. 51 O think'st thou we shall ever meet again? 53 For sweet discourses in our time to come. 54. ill-divining: prophesying of evil. 54 O God, I have an ill-divining soul! 56 As one dead in the bottom of a tomb. 57 Either my eyesight fails, or thou look'st pale. 59. Dry sorrow drinks our blood: thirsty sorrow drinks up our blood [and so we both look bloodless, pale]. 59 Dry sorrow drinks our blood. Adieu, adieu! 61. what dost thou: what business have you. him / That is renown'd for faith: him who is honored for his faithfulness [i.e., Romeo]. 64 But send him back. 64 Ho, daughter! are you up? 65 Who is't that calls? is it my lady mother? 66. not down: not yet in bed. 67. What unaccustom'd cause procures her hither? : what extraordinary reason brings her here? 66 Is she not down so late, or up so early? 67 What unaccustom'd cause procures her hither? 68. how now, Juliet! : i.e., what's the matter with you, Juliet? 68 Why, how now, Juliet! 68 Madam, I am not well. 69. your cousin's: i.e., Tybalt's. 69 Evermore weeping for your cousin's death? 70 What, wilt thou wash him from his grave with tears? 71. An if: even if. 73. shows still some want of wit: always shows some lack of good sense. 73 But much of grief shows still some want of wit. 74 Yet let me weep for such a feeling loss. 75-76. So shall you feel the loss, but not the friend / Which you weep for: [weeping as you are now doing] will make you feel the loss of your friend, but won't allow you to embrace the friend that you are weeping for. 76 Which you weep for. 77. ever weep the friend: continually weep for the friend. 77 I cannot choose but ever weep the friend. 79 As that the villain lives which slaughter'd him. 80 That same villain, Romeo. 83. like: so much as. 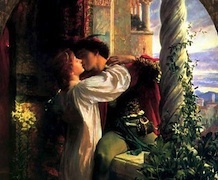 Juliet allows her mother to believe that her heart grieves for Tybalt and has a grievance against Romeo because Romeo killed Tybalt, but we know that Juliet really grieves because Romeo is gone. Juliet continues to use the same kind of double meanings in the following lines. 83 And yet no man like he doth grieve my heart. 84 That is because the traitor murderer lives. 86 Would none but I might venge my cousin's death! 90. unaccustom'd dram: i.e., poison. Lady Capulet is making a bitter pun on "dram" as meaning a small drink of liquor which will make one feel good. 92 And then, I hope, thou wilt be satisfied. 95 Is my poor heart so for a kinsman vex'd. 97. To bear a poison: to deliver a poison [to Romeo]. temper it: modify the poison. 101. wreak: take revenge. But we know that Juliet's revenge on Romeo would be to have him in her bed again. 102. his body that: the body of him who. 102 Upon his body that slaughter'd him! 103 Find thou the means, and I'll find such a man. 104 But now I'll tell thee joyful tidings, girl. 106 What are they, I beseech your ladyship? 107. careful father: father full of care [for your welfare]. 108. to . . . heaviness: in order to relieve you of your sorrow. 109. sorted out: picked out. sudden: soon to come. 110 That thou expect'st not nor I look'd not for. 111 Madam, in happy time, what day is that? 115 Shall happily make thee there a joyful bride. 117 He shall not make me there a joyful bride. 119 Ere he, that should be husband, comes to woo. 123 Rather than Paris. These are news indeed! 125 And see how he will take it at your hands. 126. drizzle dew: i.e., become misty. 127. the sunset of my brother's son: i.e., the death of Tybalt. 129. conduit: water pipe, fountain. 129 How now! a conduit, girl? what, still in tears? 131. Thou counterfeit'st: You appear to be the image of. bark: sailing ship. 136. Without a sudden calm: unless there is a sudden calm. overset: capsize. 137 Thy tempest-tossed body. How now, wife! 138 Have you deliver'd to her our decree? 139. but she will none, she gives you thanks: i.e., but she says "No, thank you." 139 Ay, sir; but she will none, she gives you thanks. 140 I would the fool were married to her grave! 141. Soft! : wait a minute, what's this? take me with you: let me understand what you mean. 143. proud: elated [at the news of her wedding to Paris]. 144. wrought: worked hard to secure. 141 Soft! take me with you, take me with you, wife. 142 How! will she none? doth she not give us thanks? 145 So worthy a gentleman to be her bride? 146. Not proud, you have; but thankful, that you have: [I am] not elated [that] you have [arranged this marriage]; but [I am] thankful that you have [arranged this marriage, out of love for me]. 148 But thankful even for hate, that is meant love. 149. chopp'd logic: illogical logic, shallow argument. 149 How, how, how, how, chopp'd logic! What is this? 153. fettle: prepare, fix up. This word was usually used in reference to horses. 'gainst: against; i.e., in preparation for. 155. hurdle: a sledge used to drag prisoners to the gallows. 156. Out: an exclamation of indignant reproach. green-sickness: the proverbial pallor of young, unmarried women. carrion: corpse, rotten meat. baggage: good-for-nothing. 157. tallow-face: Tallow is "a hard fatty substance made from rendered animal fat, used in making candles and soap." Fie, fie! what, are you mad? : Maybe Lady Capulet says this to her husband and means that Capulet has gone too far. Or maybe Lady Capulet is joining her husband in abusing their daughter. 155 Or I will drag thee on a hurdle thither. 156 Out, you green-sickness carrion! Out, you baggage! 157 Fie, fie! what, are you mad? 159 Hear me with patience but to speak a word. 160 Hang thee, young baggage! disobedient wretch! 164. My fingers itch: i.e., I can hardly resist slapping you down. 167 And that we have a curse in having her. 168 Out on her, hilding! 168 God in heaven bless her! 169 You are to blame, my lord, to rate her so. 171 Good Prudence; smatter with your gossips, go. 172 I speak no treason. 172. God-i-god-en: literally, "God yield ye [give you] good evening," but here, an impatient exclamation equivalent to "for God's sake!" 173 May not one speak? 173 Peace, you mumbling fool! 174. Utter your gravity o'er a gossip's bowl: say your wisdom over a bowl you share with one of your cronies. 175 For here we need it not. 175 You are too hot. 176. God's bread! : literally, Christ's sacrament, but Capulet is just cursing. 180. demesnes: estates. nobly lien'd: well connected. 184. mammet: doll-baby. in her fortune's tender: when good fortune is offered her. 186-187. pardon me . . . pardon you: excuse me . . . set you free. 186 I am too young; I pray you, pardon me." 189. I do not use to jest: i.e., I'm not kidding. 191-192. An . . . And: if . . . if. 189 Look to't, think on't, I do not use to jest. 190 Thursday is near; lay hand on heart, advise. 195. I'll not be forsworn: I'll never go back on my word. 195 Trust to't, bethink you; I'll not be forsworn. 197 That sees into the bottom of my grief? 198 O, sweet my mother, cast me not away! 201 In that dim monument where Tybalt lies. 202 Talk not to me, for I'll not speak a word. 203 Do as thou wilt, for I have done with thee. 204 O God!O nurse, how shall this be prevented? 208. counsel me: advise me. 209. practise stratagems: play dirty tricks. 208 By leaving earth? Comfort me, counsel me! 210 Upon so soft a subject as myself! 211 What say'st thou? Hast thou not a word of joy? 212 Faith, here it is. 213. all the world to nothing: i.e., it's a safe bet. 214. ne'er: never. challenge: claim. 215 Or, if he do, it needs must be by stealth. 217 I think it best you married with the county. 218 O, he's a lovely gentleman! 219. Romeo's . . . him: Romeo's a dish-rag in comparison to him. 220. so . . . eye: so fresh, so lively, so beautiful an eye. 221. Beshrew my very heart: curse my own heart; i.e., my heart be cursed if I'm not right. 225. As living here and you no use of him: since he is living here [on earth], but you can't have any use of him [as a husband]. 225 As living here and you no use of him. 226 Speakest thou from thy heart? 227 And from my soul too, else beshrew them both. 228. Amen: There is a hidden meaning in Juliet's "Amen!" Juliet has asked if the Nurse's advice to marry Paris comes from her heart, and the Nurse has replied that it comes from both her heart and soul, "else beshrew [curse] them both." So, when Juliet says, "Amen," she means "cursed indeed be your heart and soul for giving such advice." 230 Well, thou hast comforted me marvellous much. 233 To make confession and to be absolved. 234 Marry, I will; and this is wisely done. 235. Ancient damnation: damned old woman. 235 Ancient damnation! O most wicked fiend! 240. bosom: private thoughts. twain: separated. 240 Thou and my bosom henceforth shall be twain. 242 If all else fail, myself have power to die.